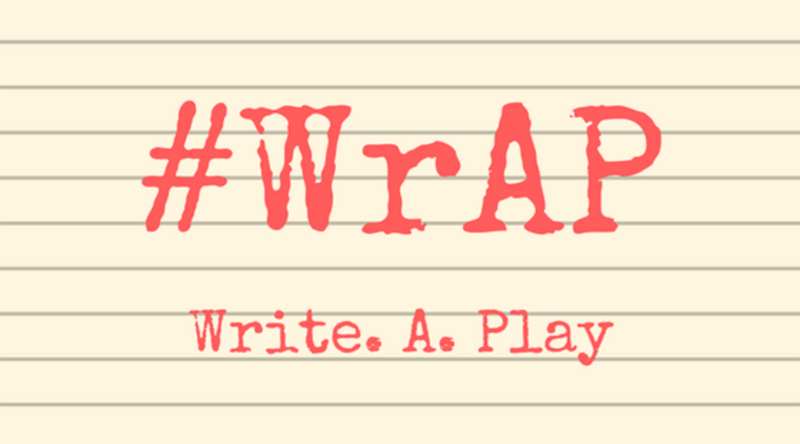 Write A Play this January with #WrAP initiative! Is your New Year’s Resolution to write more? Kickstart your writing goals with LPW, and sign up for #WrAP! What if we said you could write a play – YES a whole play – this January? Well, you can if you take part in Write a Play – or #WrAP as we’ll be calling it! January is a time for new beginnings and new goals. Whilst taking up Badminton or signing up for ukulele lessons might make you feel accomplished, it won’t help you improve your playwriting skills – but actually doing some writing will! And we’re here to help. Maybe. Maybe not. It depends how dedicated you are about getting to the end of your script. We were inspired by NaNoWriMo (National Novel Writing Month), where each November writers take on the challenge of completing the first draft of a novel. Writers who sign up for this challenge commit to writing a whopping 50,000 words in a month. And remember, ultimately you can set the goal that works for you. Sounds a bit full on with your other commitments? Don’t worry. #WrAp is all about writing as much as you can manage in January; if you finish your play, great, if you only write 20 pages, also great – that’s 20 more pages than you had at the beginning of January. Anyone who wants to write a play. It might be your first play, it might be your fiftieth. You don’t need to be based in London – this will all be happening online! All that matters is that you want to join in and challenge yourself to write your play in January. Wow. That sounds great. It must be really expensive. NOPE! Participation is FREE – but you have to be an LPW member. If you want to participate in #WrAP, firstly, you’ll need to become a LPB member (read more about why here). The good news is, that this costs around the same price per month as cup of coffee and by joining us you’ll really be helping us to support the next generation of playwrights (including you). You’ll also be getting access to some exciting member benefits. Once you’ve signed up, you’ll get access to our exclusive members website and Facebook group and everything you need to take part in WrAP – more details on this below! There will also be the opportunity for online discussion with fellow #WrAP writers (and us!) via our Members Facebook group, with scheduled sessions where you can ask questions or share concerns. Log on to our members site (if you need to join first, you can do so here). Go to the #WrAP Initiative page (note: you’ll need to be logged in as a member to access this). Sign up for the dedicated #WrAP email list. Check your inbox and click the confirmation link that you want to join. Privacy guarantee: this email will only be used for our 2018 #WrAP initiative. We don’t sell or share these, and won’t use it to send you anything you haven’t asked for. We’ll see you in January for some serious playwriting! I just filled in the membership forms, but there was no acknowledgement at the end, so I’m not sure if I’m properly signed up, please could you verify? Hi Clare, We’d recommend checking your Spam folder first, as a few members have found their confirmation got lost in there! If you need extra support, just drop us a line at members@londonplaywrights.org and we’ll be happy to help trouble shoot! I was wondering if I could sign up and write the play in portuguese, my native language. What do you think? Hi Rosane, we think this would definitely work! All our materials are offered in English, but the work is self-guided, so if you wanted to write in a different language that should absolutely be compatible with the prompts. We hope to see you in January!